Take a trip to Tuscany. 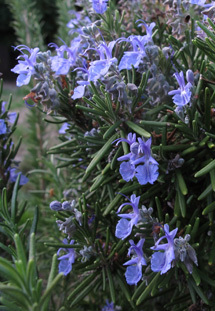 Rosemary has a long history as a favorite fragrance. Sometime in the 1300s, it was the key ingredient in the famous perfume, Hungary water. Legend tells of a queen of Hungary, who, wearing the fragrance at the age of 72, captivated the King of Poland in a romantic liaison. For the next 500 years, until the French started producing eau de Cologne in the Eighteenth Century, no other herb enjoyed the popularity of rosemary either as a scent or as a natural remedy. No wonder one of our most beloved soaps is Rosemary. We blend three essential oils to create this scent. It is predominately rosemary but tempered with lavender and softened with rose-like palmarosa. Your skin will love the Rosemary bar as much as your nose. Finely crumbled rosemary leaves add a bit of texture. A healthy dose of hemp seed oil provides a lavish moisturizer. Essential oil of rosemary in this bar transports you to the Mediterranean.